Welcome to the on-line presence of Gestare Art Collective. These pages offer a portal for you to enter into the matrixial borderspace(s)* of our collaborative and creative art processes. Gestare is Latin for the verb "to carry" in the womb. As women committed to living as process artists in relationship with each other, the earth, cosmos and all its inhabitants, we honour and practice gestation as an artful form of inquiry and pedagogy. Side Street Studio Art, Elgin, Il. USA, May 2018. Book chapter in Creating together: Participatory, community-based and collaborative arts practices across Canada. Co-editors Diane Conrad and Anita Sinner. Wilfrid Laurier University Press. Waterloo, ON. Canada. 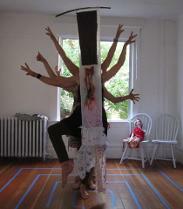 Placenta Wit: Mother Stories, Rituals, and Research. Edited by Nané Jordan. Demeter Press. 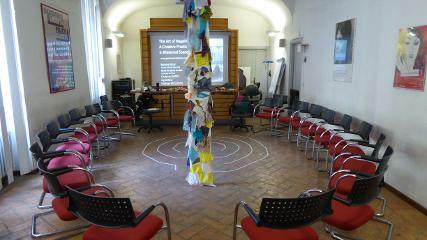 Communal Dreaming: Enlarging the space of the possible through a postmodern curriculum of Nap-Ins. Co-edited by M. Garbutt & N. Poenpagel called. The Mindful Eye: Contemplative Pedagogies in Visual Arts Education. Published by Common Ground in the Transformative Pedagogies in the Visual Domain Series. See our Co-Residencies Retreats page to find out more about all of our past Co-Residencies and retreats. 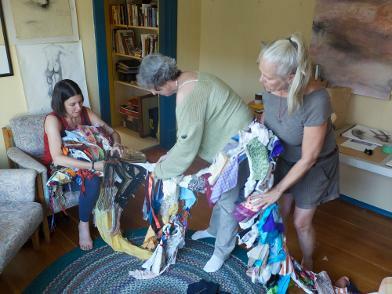 Nané, Cindy Lou and Barbara rolling up the Dream Scroll at our last Gestare Retreat on August 13, 2017 at Cindy-Lou's home. 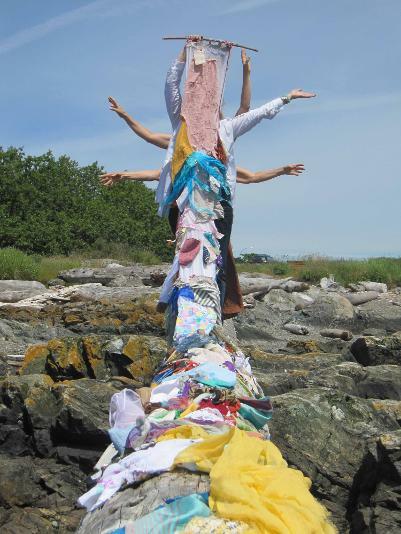 A second iteration of the spontaneous Dakini* emerged from the spirits of the women as we unfurled our dreamscroll of Nap-In dreams onto a stray boom log at the beach in Victoria, British Columbia, evoking the untamed female freedom of this traditional Tibetan Buddhist yogini form. (Like a trickster or the Fool in a Tarot deck, the dakini releases blockages in the energy field and melts frozen patters, so that the door of the mind is suddenly ajar and something new can enter. Dakinis are often connected to the phenomena of synchronicity and inexplicable coincidences of fate. *Dakini is a Tibetan word meaning "sky goer" or "sky-walking female"..
pose in the universitaire garden. Nané and Barbara facilitated a Nap-In in Rome at the Motherhood Initiative for Research and Community Involvement (MIRCI) Conference. Theme: Maternal Subjectivites: Psychology/Psychoanalysis, Literature, Culture and the Arts. Casa Internazionale delle donne, Rome, Italy. April 23 – 24, 2015. 20 women participated and 7 were part of releasing the dreams at the Tibre River later that day. 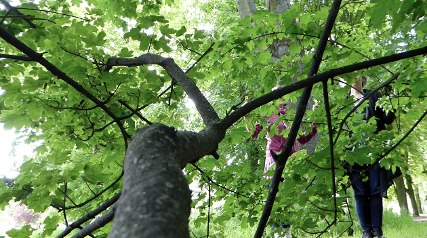 A participant Michelle Tarnopolsky blogged about her experience on her mapleleafmama blog.